Sticking with the same old toppings day after day might leave you hating pizza after a few months. With some hot new toppings, you just might look at pizza in a brand new way. Some people think that the best pizza is a simple piece with just the right amount of cheese and sliced pepperoni on top. While there is a time and a place for a pepperoni and cheese pizza, you might just find yourself craving something new and a little different. When you grow tired of the same toppings day in and day out, check out some new toppings that will tantalize your taste buds. 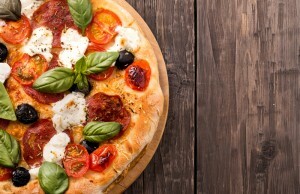 Many pizza joints know that customers want meaty and hearty pizzas, which is why you’ll often find little to no vegetables on their menus. Adding just the right amount of vegetables to a simple pie adds a slight sweetness and savory flavor that you won’t get from meat alone. Try caramelized red or white onions that the restaurant slowly cooks over low heat. This slow-cooking method brings out the sweet flavor of the onions, and it will complement any other toppings you crave. Some pizza restaurants slow roast thicker vegetables right in the pizza oven, including bell peppers and mushrooms. With thick slices of vegetables, you may not even need the meat. When looking for downtown pizza, Las Vegas tourists and locals should check out which restaurants offer a combination of cheeses. While mozzarella is the classic choice for pizza, using multiple types of cheeses might make your next pizza taste more like a comforting bowl of macaroni and cheese. Ricotta cheese adds a little touch of sweetness, while sharp cheddar adds an earthy flavor. Take your cheese pizza to the next level with the addition of a little grated Parmesan right on top. Why settle for the same old classic toppings that you always have on pizza? There is a whole world of fun toppings that let you get the taste you love while letting you enjoy something special, including cheese combinations and hearty roasted vegetables.